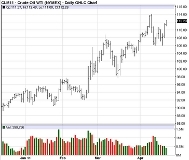 A PDF of a commodities trading e-book by successful futures trader, Jim Wyckoff, with many articles on a wide array of futures trading topics. The material contained is opinion intended for educational purposes only, and makes no guarantee of profit. 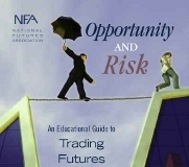 The futures trading e-book starts off with Mr. Wyckoff's list of what he believes are the most prevalent mistakes traders make in futures trading, failing to have a predetermined trading plan to failing to use protective stops. In the next feature Mr. Wyckoff address cycles and seasonality in futures trading, specifically seasonality in agricultural markets. He emphasizes that while seasonality or cycles alone are not solid trading systems, he believes they are good tools for your futures trading toolbox. The commodities trading e-book goes on to comment on the use of Fibonacci percentage "retracement" levels when determining support and resistance on futures trading charts. He continues to mention the "Golden Ratio" in this sytem of futures trading analysis. The e-book continues on to a feature about market noise and how he believes seasoned futures traders ignore it. He explains how he has come to believe that the day-to-day market noise is not of much use to most futures traders, and they should keep in mind the overall trend of the market. The next section of the commodities trading e-book hosts a section for less-experienced futures traders in which he covers the types of market orders, including stops. In the next article, "Swing Trading: Making $$$ in a Sideways Market" Mr. Wyckoff describes how to identify sideways futures trading markets and several strategies to utilize in such commodities trading situations. Next, Mr. Wyckoff describes the Percent Range (%R) technical indicator and how it attempts to measure overbought and oversold market conditions in futures trading. He then addresses how he believes this futures trading technical indicator is best utilized. Finally, the commodities trading e-book features a section of quotes and advice from Jesse Livermore, one of the most famous stocks traders of the 20th century, who was also a successful futures trader.